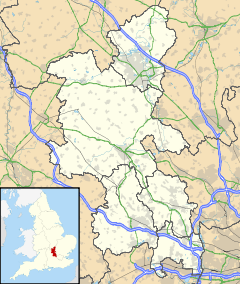 The village name is Anglo Saxon in origin, and means 'hill where wheat is grown'. The village is referred to several times in the Anglo-Saxon Chronicle generally in the form of Hwætædun. The village is at the centre of the ancient Whaddon Chase, the site for many centuries of royal hunting lands. Whaddon Chase is designated an area of 'Special Landscape Interest'. Whaddon Church of England School is a mixed Church of England primary school. It is a voluntary controlled school, which takes children from the age of four through to the age of eight. The school has approximately 50 pupils. Whaddon Hall, the village manor, was once home to the Selby family (also known as Selby-Lowndes), whose ancestor William Lowndes built the larger and grander Winslow Hall. Both mansions are still private houses. During the Second World War Whaddon Hall served as headquarters of Section VIII (Communications) of MI6, as an outpost of Bletchley Park. ^ "From the Wireless War to Warwick". 2.warwick.ac.uk. University of Warwick. Retrieved 9 November 2012. ^ Pidgeon, Geoffrey (2003). Station X — The Secret Wireless War. Universal Publishing Solutions Online Ltd. ISBN 978-1-84375-252-3. This page was last edited on 27 January 2018, at 12:17 (UTC).